Advantages: Interesting commentary on a variety of Staaken, excellent artwork, a feast of previously unpublished photos, and a multitude of 1/72 scale drawings. The Staaken has long been a favorite with Ray Rimell and so the editor of Albatros Productions takes it upon himself to author this subject. His knowledge of the aircraft’s role in the Great War puts him in good stead for this latest issue in the Datafile series. Note that this publication is not to be confused with an earlier release from this company. While that publication concentrated on the history and development of the R.VI, this one takes a different tact. More specifically, it looks at the operational careers of the Staaken R.IV, R.V, R.VII, R.XIV, R.XV, RXIVa, and R.XVI (Av). The familiar format of this series continues with the usual soft card covers containing 32 A4 size pages. Inside are 59 black and white photos with most being seen in print for the first time. They offer the viewer a tantalizing snapshot of what life would have been like around these behemoths. The crew posing for the in-flight shots is especially fascinating! The reproduction of the images is excellent and many are printed one or two to a page. This allows the reader to gain maximum benefit from the many small details. A hallmark of these publications is the inclusion of general arrangement drawings. This issue is no exception with 10 pages of George Haddow’s work being devoted to this aspect. Due to the size of the aircraft, only 1:72 scale line work is presented and this covers the R.XIV / R.XV, R.IV R.12/15, R.XVI (Av) R.49/17, and R.XIVa R.69/18-R.72/18. The artwork is as one expects with two very nice profiles by Ronny Bar. The evocative cover is the work of Robert Karr and depicts R.IV R.12/16 colliding with a steel cable courtesy of the Woolwich Balloon barrage. The story of this fascinating event is fully covered in the text. Rounding out the book is a colours and marking section which describes the appearance of these monsters. A table lists the statistics of the aircraft types and a further appendix describes the R-plane raids on England between 28 September 1917 and 19-20 May 1918. The service histories of these selected Staaken Riesenfluzeuge makes for fascinating reading. 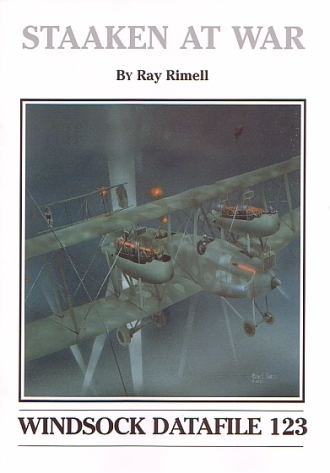 Ray Rimell’s writing style allows the reader to easily digest the information and the artwork is just icing on the cake. If you even have just a passing interest in Germany’s giant bombers, then you won’t be disappointed with this book.